ING Miami. Run Miami. Run Famous. Nothing beats running through the city I love! Pure Protein: Chocolate Peanut butter Bars. Flatbread with Almond butter. Me, Myself and I. I have tons of running partners of all running levels; however, my core training is done on my own. 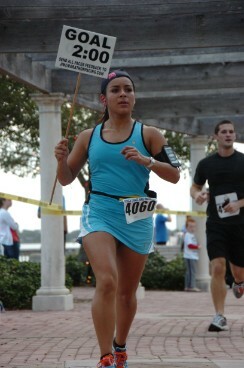 I run because It makes me feel empowered! You can talk the talk but can you walk the walk? Running is about having, Guts! That’s what makes a true runner. The guts to give it your all with every stride that you take. The dedication to hit the road or treadmill everyday. The perseverance to overcome the obstacles that make running a challenge. The diligence to get out there and run in spite of the aches and pains. It’s not occasional running, it’s everyday running and that’s why I love to run. My best running memory was when I ran in my first race, the ING Miami Half Marathon in 2010 and reaching mile 11 having all the spectators cheer me on, I got an instant runners high, I’d never felt stronger in life. For me pacing is a way for me to give back to running. It’s my way of thanking anyone that ever trained with me. I want to help as many people as I can, there’s no better feeling than helping someone accomplish their goals. Everyone deserves that feeling at some points in life and if I can help, I will! Last year I mastered pacing, hitting every mile at the very exact second, a watch became obsolete. Because I love to hear funny training stories, like the first time you got caught in the rain, the first time you got lost in the trails, oh yeah, this race is going to be an experience. Be ready to have FUN! I love to talk and sing on my runs, keeps your mind on something else than running, when you least expect it we will be at the finish line! Bring you’re “A” game! You’ve trained long enough, now its time to let it pay off and have some FUN! Phi Mu Tailgate Invitational benefitting the Children’s Miracle Network.